Being in the middle of my 3 month motorcycle tour in Asia, I have had my eyes opened to a lot of cultural differences. Many countries like the one I started my adventure in, Vietnam, have strict cc limits for motorcycles. The limit is generally 250cc but it is near impossible to get a license to ride anything bigger then a 165cc. Pretty much all these are mopeds and scooters by our definition. 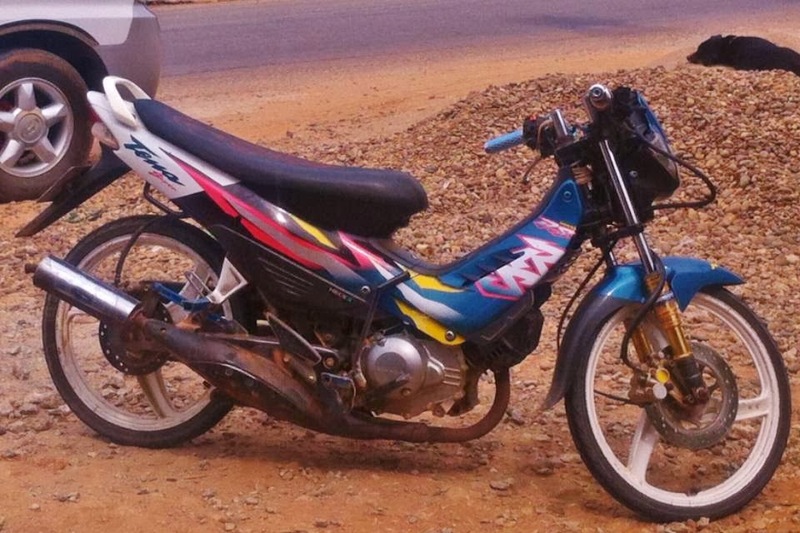 If you have a 50cc or less, you don't need any license. For this reason many get 50cc bikes and put a bigger motor in them. Some of the new motors are 2 strokes too like this one making a real screamer out of them. This one had clip on bars and a racing front end. Other then changing the motors, almost all the bikes that I seen in Vietnam remained very stock appearing with no care given to make them stand out in a crowd other than washing them. 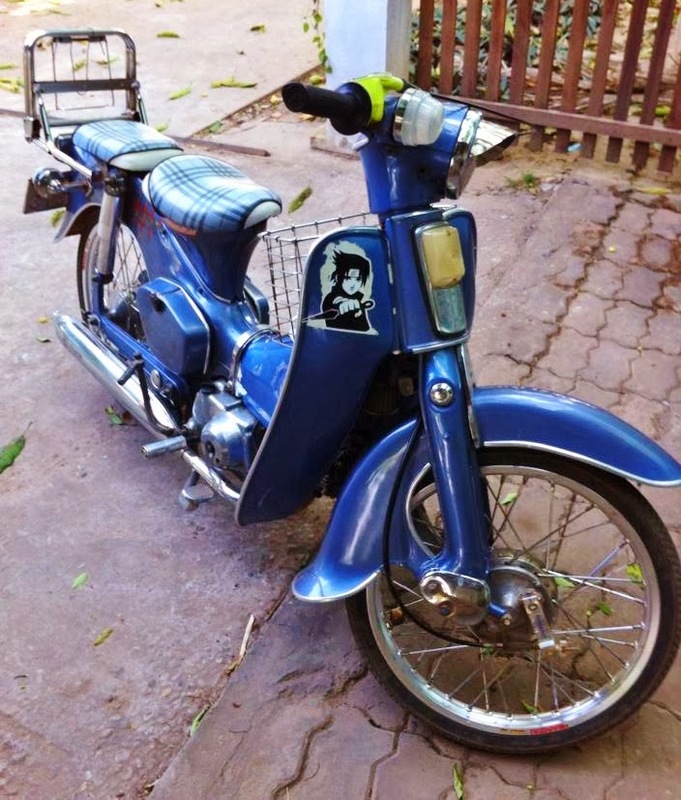 My bike stood out in Vietnam with the custom rattle can purple paint job and the prismatique stickers I applied. But all that changed when I crossed the border to Laos especially in the western towns that border Thailand. Everywhere I looked cars and bikes and all kinds of custom trinkets. 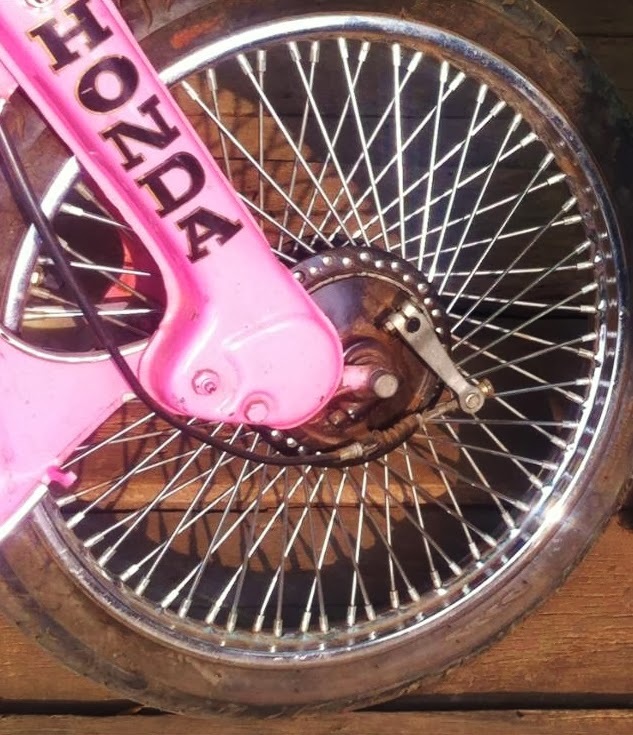 Another thing I found in Laos was many of the back yard type shops carried custom rims with anodized colors mag and extra spoked spoke wheels too. Many of them looked like they had used a gift card from J.C. Whitney to decorate their rides but still, they were obviously about fashion and not just function. I even saw some bikes with neon riding at night but I refuse to take pictures of that. But the best came as I was traveling down the highway south towards the Cambodia border. I saw my first chopper. Yes, it was so cool I had to turn around and got back just in time to catch some photos of the bike and it's creator/owner ride off from the store he was shopping at. The owner was super cool. 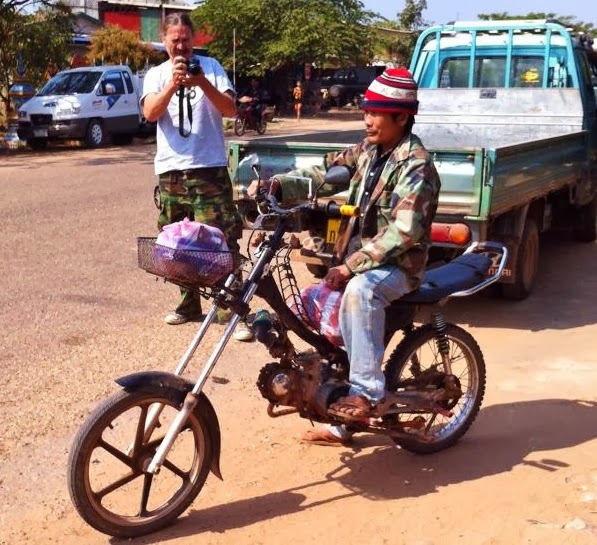 Although he spoke not one word of English, He knew that his bike was getting attention and rolled the bike out and posed for this photo shoot while all the passerby's watched the fun. Looking closely you can see that he has slid the fork tubes out of the top triple tree and all the way down to the bottom tree to make them longer. He has also removed the front brake caliber, rotor and brake lines. His intake, carb and filter setup is also homemade and radical even by our standards. It has been an eye opening experience to say the least but I am not even half over with this trip. After entering Cambodia I plan on riding west into Thailand and then decide to head south to Malaysia or north west to Myanmar and Bangladesh. Watch My Facebook page- Everything Bean're for daily updates. Far Out Kevin! Radical Trip! keep on Ridin'! Enjoy the adventures to come my friend. I love it. I ride and rebuild wrecked and custom Harleys but small cc Jap bikes have my heart. If I didn't have to eat I'd spend all my time restoring Trail 70s and CM90s I know you're having a blast and thanks for sharing it with us.